Following a detailed assessment, a treatment programme will be individually prescribed. This may include manual therapy, electrotherapy, thermal therapy, movement, soft tissue manipulation and a home programme package. Many of these techniques are used in combination to achieve maximum recovery for your pet. Hands on techniques are useful in reducing muscle spasm, relieving pain, reducing soft tissue adhesions, mobilising deep structures and improving joint mobility. Joint mobilisations can be applied to the spinal joints and also the peripheral joints. Mobilisations are used by physiotherapists to increase joint range of movement, increase proprioceptive awareness, decrease pain and reduce muscle spasm. Soft tissue techniques involve the physiotherapists using techniques such has myofascial release, massage and trigger point release. These techniques help to reduce swelling, decrease pain, reduce muscle spasm, promote well being and can help your pet to feel more comfortable. Soft tissue techniques are often used in combination with joint mobilisations and passive stretches. Reflex inhibition using the animal’s natural reflexes to stimulate joint mobilisations and soft tissue stretch. Passive stretches on joints and muscles and are used to increase joint range of movement, lengthen the resting tension of muscles, reduce muscle spasm and decrease pain. Massage therapy - Whilst massage can be used for relaxation, it can also be used to tone and warm up muscles and improve circulation, thus oxygenating the muscles and removing waste products. In addition, it can help move lymph, blood and oxygen around the body. As with humans, massage can be used to help maintain condition and can also be used for general well being, for relaxation, pre or post exercise and for rehabilitation. Low Level Laser, Phototherapy, Ultrasound, and Pulsed Electromagnetic Energy all work at a cellular level to provide pain relief, promote the resolution of inflammation, reduce swelling, improve the quality and speed of healing, and the reduction of scar formation. Tens can also help provide complementary pain relief. The main use of LASER in animal physiotherapy is to promote soft tissue healing and decrease pain. It is also useful for trigger point release and very good in helping to assist the optimum healing of open wounds. LASER therapy - for trigger point therapy to relieve deep, localised pain associated with chronic muscle spasm. Used for superficial lesions in tendons, ligaments, joint capsules and muscles. It can be used for pain relief over peripheral nerves or centrally at nerve roots. It can also be used to enhance the body’s immune and lymphatic system. A non-invasive treatment tool for numerous acute and chronic conditions on small animals, domestic pets, horses and livestock. Listed below are a few of the conditions we can help with phototherapy. Infected wounds - Blue LED is used due to its antibacterial effects and helps reduce infection around open and healing wounds. The application of sound waves to the injured area and able to penetrate to deeper structures (up to 5cm), excellent at healing tendons, ligaments and joint capsules. Also the treatment of choice in reducing old scares in all soft tissues - including muscles. Allows us to better manage new cell alignment in healing superficial flexor tendon or suspensory ligament injury. The application of ultrasound is normally well tolerated by animals. Tens can be used for pain relief involving the use of a mild electrical current. This can be very beneficial for acute pain e.g following spinal surgery. 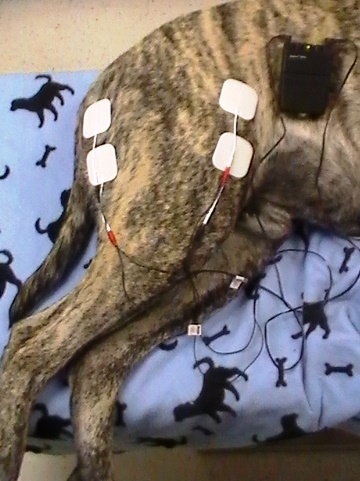 When the machine is switched on, small electrical impulses are delivered to the affected area of the body and the animal will feel a gentle tingling sensation. This machine stimulates sensory and motor nerves to reduce pain after surgery but can also be used for chronic or acute pain associated with injury. The electrical impulses can reduce the pain signals going to the spinal cord and brain, which may help relieve pain and relax muscles. They may also stimulate the production of endorphins, which are the body's natural painkillers. Promotes and hastens the speed of bony union in both traumatically and surgically induced fractures. Pain relief over peripheral nerves or centrally over nerve roots. Induces vasoconstriction to reduce swelling in acute inflammation. Induces vasodilation in muscles in preparation for exercise. Activo-Med Therapy Systems - (Equine only at this stage). The therapy rug contains 5 lines of strategically placed PEMF spools and 5 lines of massage modules. The control box on the rug activates these lines in the sequence of 1-2-3-5-4 giving a high support of the venous blood flow to the heart in conformity to the blood circulation and the lymphatic system. One control box operates both applications in one combined therapy session. The Activo-Med Combi pro rug provides pulsed electromagnetic (PEMF) and massage therapy across the horse from poll to tail including back, shoulder and thigh areas. The rug contains 19 strategically placed PEMF spools and 14 cyclonic massage modules over the main muscle groups that work as directed by the pre-programmed control box. The PEMF elements uses a range of therapist selected therapeutic frequencies to help promote cell efficiency, cell recovery and helps them to work more efficiently. The massage element gives high support of the venous blood flow to the heart in conformity to the blood circulation and the lymphatic system. Just as human athletes can benefit from sports massages to help loosen tight muscles and maintain optimum performance, horses can too. When this therapy is included inside products, the strategically placed cyclonic modules work on key muscle groups at the correct pressure and sequence to generate the best possible results. Includes ice packs, ice massage and cold water irrigation. To reduce acute soft tissues inflammation following trauma or surgery. Reduces swelling and has direct pain relieving properties by acting on peripheral sensory nerves. It often forms part of the home programme. Vitally important as all animals, both large and small, need to be able to move around comfortably and perform their daily functions to have quality of life. Exercise rehabilitation is individual to individual animals, whether you have a working dog, competition horse or elderly dog/cat or a best friend that shares your life, they will be treated as an individual and their needs assessed and catered for. It may be important for the elderly pet to be able to get out of their basket or stable and go for short strolls or have time in the paddock or the advanced competition/working dog/ horse who needs to be able to turn sharply and generate enough power to jump fences or perform intricate dressage movements. It helps to maintain those animals suffering from chronic orthopaedic conditions such as kissing spines and osteoarthritis to gradually re-educate gait to support any weaknesses.